As part of its activities commemorating the World Youth Skills Day 2017, UNESCO-UNEVOC organized its annual Skills in Action Photo Competition. With more than 250 submissions received from all over the world, focused on how TVET is empowering young people in their communities, according to the three main thematic areas focused under the UNESCO TVET Strategy. We are proud to announce the winner of the Skills in Action Photo Competition 2017. 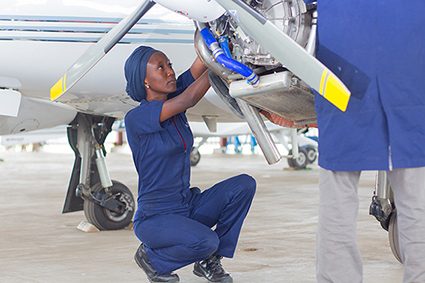 Description: This image was taken at the aviation college in Kwara State, Nigeria. It illustrates inclusiveness in the aviation workplace. For a long time now, the world has been a male dominated playground. From boardroom meeting to ivy sports leagues, men have shown courage in these fields, while women were considered incapable, no thanks to the old cliché mentality “She is just a woman”. Though more recently, women have started standing up for equal opportunities, a lot have had to face the heat, break barriers and build careers in male dominated industries thereby paving the way for others to follow. 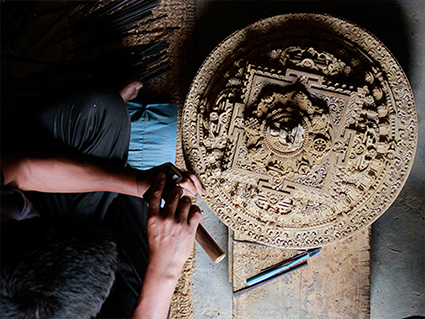 Description: This heritage skill has been passed from many generations but is now endangered of being lost. This is because craft men and women earn low wages despite the high value of their products in the international market. There is a need to promote and encourage youth to take on these traditional skills so this skill won’t be lost forever. The photo was taken at Khokana, a tiny Newari village south of Kathmandu. It has been nominated as a UNESCO World Heritage site representing a vernacular village and is famous for its mustard-oil seed industry. The winner of the social media award gathered 7.3k out of more than 16k likes on Facebook at the end of the last day of voting (14 July 2017). Description: The mission of TVET is to improve skills for sustainable progress, especially targeting the youth. The finalists are listed in no particular order. All the titles are linked to the photos on our Facebook SkillsinAction Photo Competition Album which you can access only when you have a Facebook account. All the winners will be contacted to receive their prizes and certificates accordingly. We wish to thank all the participants who were willing to share their amazing photos and have demonstrated their awesome skills in photography. Disclaimer: the following photos were submitted as part of the SkillsinAction Photo Competition organized by UNESCO-UNEVOC International Centre. The photos represent the views of the photographers; they are not necessarily those of UNESCO and do not commit the Organization. Are you an amateur or professional photographer? Use your skills to capture pictures that not only show but tell amazing stories and submit your photos to the #SkillsInAction Photo Competition! This competition is organized as part of UNESCO-UNEVOC International Centre’s activities in celebrating World Youth Skills Day this July 2017.
you are at least 18 years old. You can either be a professional or amateur photographer. you are the owner or copyright holder of the photo entry/entries. What should my photo show? It is time to highlight the opportunities and positive impact of TVET for people, their families and their local communities. Until when can I submit? All photos must be submitted using the submission form on or before 30 June 2017 to unevoc.skills(at)unesco.org. Make sure you read through the submission process before sending in you pictures! All submitted photos should be with a title, a brief paragraph (not more than 100 words) explaining the photo, indicating also where and when it was taken, and a short biography introducing who you are. All photos submitted should be in jpeg format. The longer side should be at least 3,000 pixels. The entrants are allowed to digitally manipulate entries slightly and state the nature of manipulation. Please do not include any watermarks or borders in your photos. Your photos should be related to the theme as mentioned above. After taking your photos focused on youth. 1. Add a title and write a short description for every photo. 5. Send the completed form (with thumbnails of the pictures) along with the original photos to unevoc.skills(at)unesco.org with the following email subject heading Last-name_SAPhotoCompetition. Note that the attachment size limit is 10 MB. In case of multiple entries that cannot be sent via email, you can use any cloud storage servers you prefer and provide us the direct link (no signing up required) to download. 1. Upon submission, UNESCO-UNEVOC will preliminary filter entries upon compliance of the basic terms and conditions. 3. A notification will be given by email or by call to the entrants to inform them that their entries have been shortlisted. 4. All shortlisted photos will be uploaded on UNESCO-UNEVOC Page on Facebook https://www.facebook.com/UNEVOC/. Social media community will be encourage to cast their vote for the most popular Skills-in-Action Photo on Facebook. The author of the most popular Skills-in-Action Photo will receive a special award. 5.Winners of the Skills-in-Action Photo Competition will be announced on 17 July in celebration of the World Youth Skills Day. Often viewed as a second-class education, technical and vocational education and training has been subject to image debates for decades. Across the globe, TVET development has suffered from poor investment, quality and relevance. 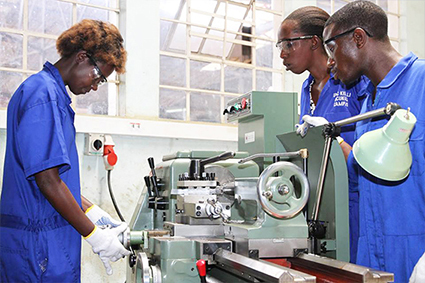 However, in a world where countries are facing high levels of youth unemployment, rapidly changing labour markets, technological advancements, and persistent social inequalities, the important role of TVET is increasingly being recognized. The orientation of TVET towards the world of work and the acquisition of employability skills means it is well placed to address global issues and it also has an important role in promoting sustainable development. Whether acquired at school or in the workplace, every day people across the globe use their skills to make the world a better place. Unfortunately, there is a lack of practical and insightful evidence on how people worldwide are benefitting from technical and vocational education and training. The stories remain largely untold, which hinders awareness raising and further investments in TVET. To allow UNESCO-UNEVOC to develop a Photo Library that can cater to the need of TVET stakeholders to promote technical and vocational education and training through various communication and publication projects. The Photo Library will be regarded as an Open Access Repository, which may be accessed by anyone under Creative Commons 3.0 IGO License.